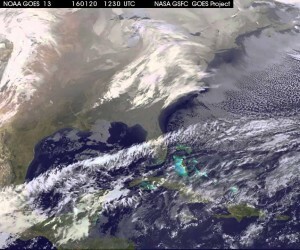 The massive winter storm expected to blast the East Coast beginning Friday is already dominating NASA satellite images. Images taken by NASA and NOAA satellites show the lumbering beast gathering mass as it prepared to sweep up the East Coast on Friday and into Saturday. Snow is predicted to bury Washington, D.C., in a blanket two feet deep, with Philadelphia bracing for 18 inches and New York up to a foot, according to estimates by the National Weather Service. Comparing it to the “Snowmageddon” storm that paralyzed the capital in 2010, and expecting it to rank near the top 10 blizzards ever to assault the Eastern United States, Paul Kocin of the service’s Weather Prediction Service nonetheless said the weekend timing would limit damage and injuries. While snow is the element hitting the headlines, with blizzard warnings or watches lighting up the storm’s expected path from Arkansas and Tennessee all the way up to New York, that is only one aspect of the weather system. It also has the potential to inflict “brutually high winds, dangerous inland flooding,” and “even the possibility of thunder snow,” according to weather service director Louis Uccellini. “It does have the potential to be an extremely dangerous storm that can affect more than 50 million people,” Mr. Uccellini told the Associated Press. Five states and the District of Colombia have declared states of emergency. Supermarkets have been stripped of supplies. Schools and government offices are closing early. And thousands of flights have been cancelled. The blizzard’s bulls-eye is set to be Washington, according to Uccellini. The city’s subway is set to shut down for most of the weekend, an unusual step, even during major storms. New York is likely to be struck by the northern reaches of the system, while Boston looks to be escaping this time. Further south, from Texas to Florida, severe weather is also expected to strike, though without the snow. The mayhem is expected to be less severe than superstorm Sandy, but Tennessee, North Carolina, Virginia, Maryland, Pennsylvania and parts of other states have all declared emergencies. All major airlines are allowing passengers to rebook on earlier or later flights, to avoid the weekend weather. Up to 5,000 flights are expected to be cancelled, according to flight tracking site Flight Aware. But all is not lost. After a recent act of Congress, sledding will be welcome on Capitol Hill for the first time in decades, as long as conditions are safe. And the president? He will be hunkered down at the White House, according to spokesman Josh Earnest.